The first series of Merlin, a British fantasy television series, began on 20 September 2008 and ended on 13 December 2008. Regular cast members for the first series include Colin Morgan, Bradley James, Katie McGrath, Angel Coulby, Anthony Head, Richard Wilson, and John Hurt as the voice of the Great Dragon. The first series contained thirteen episodes, with 7.15 million tuning into the premier and 6.27 for the series finale. It was the only series to be comprised completely of stand-alone episodes. Before the series finale, the BBC confirmed that the series was renewed for a further 13 episode second series. Series two premiered on 19 September 2009. Merlin and Arthur must work together to protect the great kingdom of Camelot against dark sorcery. But Merlin faces a tough challenge in hiding his dark secret from his best friends. Because the only way to fight magic... is with magic. The teenaged warlock Merlin is sent by his mother to lead an anonymous life in Camelot, under the care of the court physician Gaius. On his arrival, he sees the execution of a man accused of sorcery as the King, Uther Pendragon, has banned sorcery on pain of death. A hideous old woman, the condemned man's mother and a sorceress, vows revenge ("A son for a son!") before vanishing. Merlin realizes he must keep a low profile. He then discovers the Great Dragon, who tells him that he must protect Arthur until he becomes king and guide him to unite Albion. Merlin disagrees, seeing Arthur as an obnoxious bully. At a feast, the disguised mother of the sorcerer casts a spell on the guests and attempts to stab a defenseless Arthur. Merlin interferes, saving Arthur's life, and is rewarded with a position as Arthur's manservant. Uther holds an annual tournament for the knights, in which Arthur is the defending champion. Sir Valiant has a magic secret weapon: a shield from which the poisonous serpents can come to life and attack. Merlin finds out and tells Arthur. Arthur accuses Valiant of cheating, but the only 'worthy' witness has died and a servant's word is useless against a knight. Arthur is furious to be humiliated and fires Merlin. He prepares for his own match with Valiant, expecting to die. After enigmatic encouragement from the Great Dragon, Merlin decides against giving up and resorts to a magic book Gaius gave him. The dark sorceress Nimueh casts a spell on a dragon egg which she throws into the castle's water supply. The next day, people start dying of a plague which turns their skin white with dark blue veins. 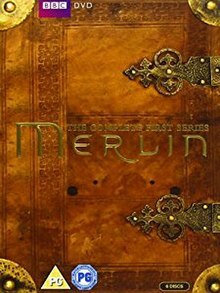 Uther orders Arthur to search all Camelot for the sorcerer he believes to have caused the epidemic - only a magic trick saves Merlin from having his book found. When Gwen's father exhibits symptoms, Merlin disregards Gaius's warning by curing him. However, when Arthur reports the recovery, Uther believes Gwen to be the sorceress and sentences her to death. With some prompting from Morgana, Arthur goes with Merlin to hunt down the monster (an afanc). While Camelot prepares to celebrate peace with Mercia's visiting ruler Bayard, Nimueh forges a poisoned chalice and replaces it with one due to be given to Arthur. The disguised sorceress then warns Merlin, blaming Bayard. Uther makes Merlin test the goblet by drinking from it (as he is a 'disposable' servant) and Merlin collapses. Gaius diagnoses a fatal poison; the only cure is from a flower which grows only in certain caves, but the perilous journey to it may take too long. Arthur bravely rides out, although Uther forbids him to 'risk a king' for a pawn. Nimueh plays the damsel in distress and local guide, to make sure Arthur is exposed to horrible monsters, but even on his deathbed Merlin conjures magical aid. When Arthur brings the flower, Uther jails his disobedient heir and refuses to have it brought to Gaius. Gwen's ingenuity solves that problem, but they still have to deal with Bayard. Merlin would have been killed by a griffin (half eagle, half lion) if it hadn't been for Lancelot, who attacks it and gets them away safely. Learning Lancelot's dream is to become a knight, Merlin brings him to court and magically forges proof of nobility so that he can apply. Lancelot passes hazing and close combat tests against Arthur, but is found out as commoner and jailed. When the griffin attacks Camelot, and also the royal castle, the knights' arms prove unable to harm the monster. Arthur frees Lancelot, who confronts the griffin. Merlin uses magic to help Lancelot triumph where all the other knights had failed. Uther and Arthur disagree over whether Lancelot can serve as a knight, and Lancelot leaves Camelot. Morgana falls ill with an unidentified brain disease which Gaius is unable to cure. A mysterious healer, Edwin, proves that his 'remedy to cure all ills' seemingly helps her, but actually removes the cursed black beetle that caused the illness. Uther retires Gaius and instates Edwin as the new court physician. Gaius secretly gets court archivist Geoffrey to give him access to the sealed records of Uther's purge of magic, proving Edwin's parents were executed as sorcerers. Edwin threatens to expose Merlin if Gaius tells Uther, leaving Gaius with an impossible choice. After consulting with the Great Dragon, Gaius decides to step down and leave Camelot (calling Merlin the 'son he never had'). Edwin uses another beetle to condemn Uther to an agonizing death. Gaius returns at the last minute, but it takes Merlin to save the day. Arthur rescues the elderly Aulfric and his pretty daughter Sophia from bandits and they are welcomed to Camelot. Arthur quickly falls in love with Sophia and they plan to elope. Morgana is very alarmed as she has a recurring dream in which Sophia drowns Arthur. She confides in Gaius and Merlin, who realize that the dreams are prophetic and that Morgana may have magic. Merlin follows Aulfric to a lake, where he discovers that father and daughter are Sidhes, former immortals who have lost their immortality and who must kill Arthur in order to regain it. When a druid is caught by the king's guards, his son sends out a telepathic call for help. Merlin responds and hides the boy, Mordred, in Morgana's chambers. Morgana forms a close bond with Mordred and risks her life attempting to smuggle him out of Camelot. When this fails, Arthur joins in the plot to help Mordred escape. Merlin must decide whether or not to help when the Great Dragon hints at dark prophecies about Mordred. The Black Knight arrives to interrupt Arthur's coming-of-age celebrations and throws down the gauntlet to any knight who will fight him. He kills them all one by one. Gaius discovers that he is Uther's dead brother-in-law, summoned from the grave by the witch Nimueh. He is seeking revenge for the death of his sister, who died giving birth to Arthur by way of magic from Nimueh. Merlin learns from the Great Dragon that only a special sword (Excalibur), burnished with the Dragon's fiery breath, can kill the knight. The Dragon warns Merlin that only Arthur can wield it. Arthur is next to fight the Black Knight, but Uther takes Excalibur and faces the knight himself, slaying him in the end. Now that the sword has been wielded by someone other than Arthur, it is capable of being used for evil; to prevent that, the Great Dragon instructs Merlin to hide Excalibur far from the reach of mortal men. Hearing that his village is being threatened by a warlord and his gang, Merlin travels home with Gwen and Morgana to help. Arthur joins them and does his best to drill the peaceful villagers into a fighting force, but Merlin's friend William dismisses him as an egotist. Gwen calls Arthur out on his insensitivity to the villagers' humble ways and also fights for the women's right to fight. But when it comes to the fight, the villagers are still inexperienced and Merlin risks exposing himself as sorcerer to drive off the invaders. During the battle, Merlin conjures up a storm to drive off the invaders, which Arthur sees. During the ensuing battle, William saves Arthur's life, and takes the blame for the magic storm. Arthur pardons William on his (William's) death bed. Despite Merlin's protests, Arthur kills a unicorn while out hunting and presents Uther with its horn. Father and son ignore Gaius's warning that it is bad luck to kill a unicorn, and soon the crops wither and the well water turns to sand. The mystic Anhora, guardian of the unicorns, arrives in Camelot to tell Arthur that his stupidity has cursed the land and that he alone can lift that curse. He faces a number of tests, first in Camelot and then in the Labyrinth of Gedref. Merlin follows him despite being told to stay behind. In the end, Arthur saves the day with a demonstration of selflessness, ultimately restoring the welfare of Camelot and the unicorn itself. Gwen's father Tom (Camelot's blacksmith) is approached by Tauren, who possesses the alchemist's stone and wants Tom's help in turning base metal into gold which he intends to use to overthrow the king. The palace guards raid the smithy and Tauren escapes while Tom is caught and sentenced to death. Morgana gives him the key to the cells, but Tom is killed trying to escape. Having spent time in the cells following an argument with Uther, Morgana retrieves the alchemist's stone and delivers it to Tauren. She joins Tauren's plot to assassinate Uther, unaware that Merlin is listening in. On the pretext of visiting her father's grave, Morgana leads Uther into Tauren's trap. Merlin must decide whether Uther's life is worth saving. However, in the end, is Morgana who has a change of heart and saves Uther. A huge monster, the Questing Beast, is on the loose near Camelot. Morgana has a nightmare of Arthur's death, but he ignores her warning and is bitten by the creature before Merlin slays it. The Great Dragon tells Merlin that in order to save Arthur he must travel to the Isle of the Blessed, where he meets Nimueh. She gives him the antidote (water from the Cup of Life) but warns him another life must be sacrificed to save Arthur's. Merlin gives the antidote to Arthur and the prince recovers, but Merlin's mother arrives in Camelot with a terrible illness. Merlin prepares to return to the Isle of the Blessed, however Gaius gets there first. As Gaius sacrifices himself, Merlin faces the greatest test so far of his emotions and his magic powers in a final showdown with Nimueh. ^ "Weekly Viewing Summary (see relevant week)". BARB. Archived from the original on 8 November 2008.